Nuts are simply nature's way if illustrating to we humans that good things can also come in small packages. Various crunchy nuts have numerous health benefits that you should be enjoying to maintain sound health. Walnuts, cashew nuts, almonds, hazelnuts, and pine nuts are handful of great delights to your health. Out of all the nuts we have in this word, Pistachios is often the most ignored and underrated. 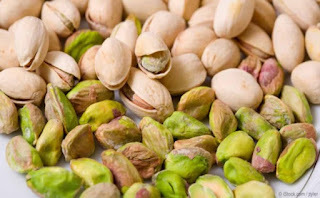 Pistachios nuts also known as Pista, are not only good for garnishing sweets and savouries, but they also make some of the healthiest foods to munch on. Their vibrant colour indicates the presence of high antioxidant content. Pistachios are also rich in beta-carotene and the compound cleanolic acid, both of which have anti-inflammatory properties. Pistas also contains phytosterols, a type of anti-inflammatory plant hormone which aids in improving one's immunity. All nuts, including Pistas, contains high concentration of protein and healthy fats, with high amount of fibre and monounsaturated fats. You can consume up to 30g per day to enjoy its health benefits. It is also advisable to consume mixtures of various nuts. Let me now show you some health benefits of consuming Pistachios. Moderate consumption of pistachios may help in promoting your heart health. An expert explains that pistachios are rich in monounsaturated fatty acids that canhelp reduce high blood pressure. It also contains phytosterols which reduces the absorption of dietary cholesterol from different foods, which further improves your heart health. Since Pistachios are high in fibre, they can make you feel full for longer period of time, thereby preventing unnecessary over eating. The fibre content in pistas can also help you to boost your metabolism. In addition, the monounsaturated fats present in pistachios are soluble in nature and hence, helps in preventing weight gain. The high amount of fibre in pistachios helps in strengthening your digestive system. Various studies, including the once carried out in the University of Florida suggests that pistachios are good for the intestinal bacteria and they further aid in boosting good gut bacteria. Due to the numerous antioxidants found in pistachios, it helps in protecting your body from oxidative stress which causes further damage to your health. The presence of antioxidants in vitamin E and C, protects your body from free radicals that cause damage in the body. The high concentration of vitamin E present in pistas helps in promoting good eye health and also improve your vision. It also contains carotenoids which protect your eyes from macular degeneration and cataract. Consuming pistachios on a daily basis can help you keep your immune levels at its peak. It has high amounts of vitamin B6, which is highly important for the immun system to function properly. These are the top 6 pistachios health benefits you can easily enjoy as you consume it moderately. You can also eat this wonder nuts in a daily basis, but let it be in moderation and you should also mix them with other nuts so that you do not end up increasing your calorie intake. Please use the share buttons below to get this message across.